The five-star Grand Hotel dei Dogi (formerly the Boscolo Venezia, as indicated on the map and video below) belongs to the Dedica Anthology group of boutique luxury hotels. Its 72 rooms occupy an historic palazzo in the Cannaregio district. Amenities include a huge private garden, a water-taxi landing on the Venetian Lagoon, an upmarket restaurant and bar, a spa and wellness center, and a free hotel shuttle boat to the Piazza San Marco. The Orto (a.k.a. Madonna dell'Orto) waterbus stop is close to the hotel. It's used by several ACTV vaporetto lines and the Alilaguna Orange Line airport boat, and there are no bridges between the pier and the hotel. At the Madonna dell'Orto Canal, turn right. 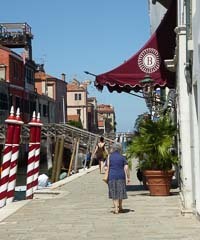 The hotel's entrance will be just ahead of you on the fondamenta or sidewalk along the canal.